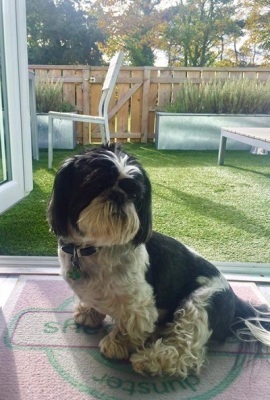 As dog owners ourselves we were fed up with having to accept second rate accommodation just because we wanted to bring our best friends with us, when we knew they were better behaved than most people. When businesses say they are "dog friendly" what they often mean is they tolerate dogs. 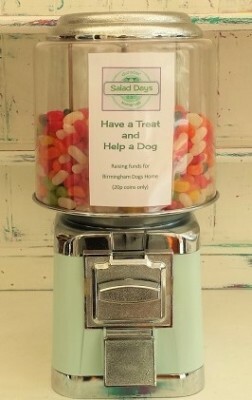 So at Salad Days & Holi Moli we don’t just accept dogs, we genuinely welcome them in a way befitting your best friend. Dunster Beach is the ideal place to holiday with your dog, many pubs and restaurants accommodate dogs and it is of course a fantastic area to go for those long and short walks. 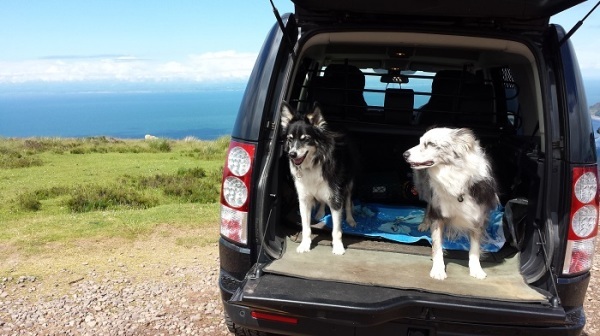 Situated on the West Somerset Coast Path and a short walk to the beginning of the South West Coast Path and the Steam Coast Trail, Dunster Beach offers a sandy beach for your dog to burn off some of that canine energy with both Minehead and Blue Anchor Bay just a 30 minute walk away. 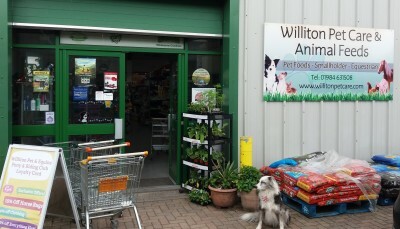 The Dunster Beach site is dog friendly with water bowls around the shop and dog waste bins aplenty. 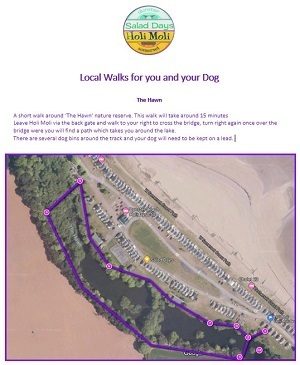 You and your dog can walk all around the site and nature reserve, but they do need to be on a lead, on the beach is a different matter, here they can run as free as they please below the tide line. 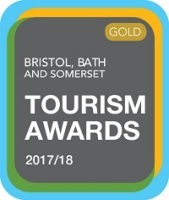 We are lucky to be only a short walk away from the South West Coast Path, why not use the interactive map on our Walk and Explore page to help plan your days out before you arrive. 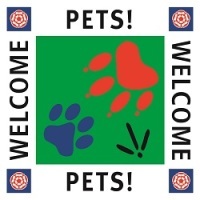 We welcome well behaved dogs whether they are assistance dogs, your family pet or both. 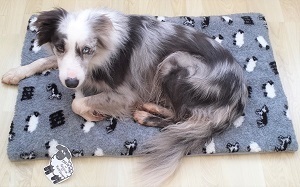 If you have more than one dog particularly if they are one of the larger breeds, we ask that you contact us before booking either by email or by using the 'contact us' form on the tariff page, to see if Salad Days or Holi Moli can comfortably accommodate them. 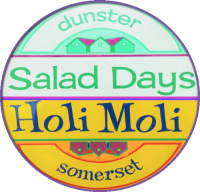 At Salad Days & Holi Moli you will find a welcome basket for you and your dog. 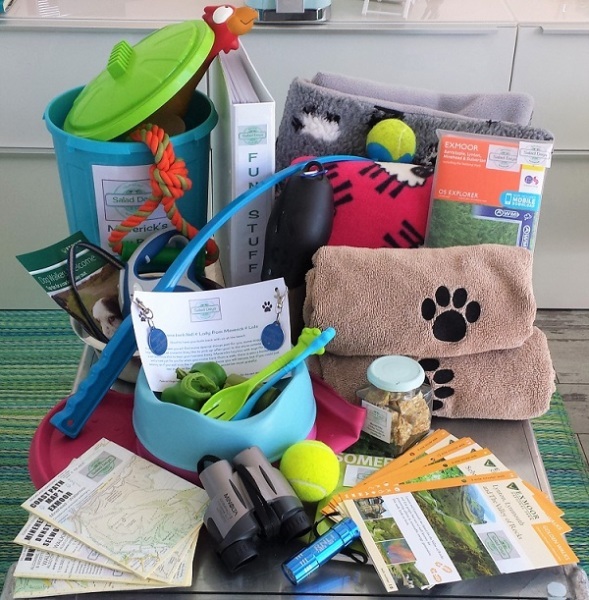 We provide towels for those muddy paws, homemade treats, a ball and throw stick, water and food bowls, biodegradable poop bags and holders, extendable leads to allow your dogs a little more freedom around the site, throws should your dog want to sleep on the sofa and holiday tags as well as a selection of local maps. At Holi Moli there is the addition of an outside 'dog wash'. Both front and back gardens are fully fenced and gated and each beach hut also has a stable door to the front. To help you when it comes to cleaning those muddy paws we have also added tethering points. 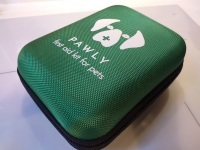 We provide an area to store your dog's travel items and a torch for those night time walks. 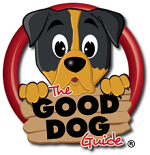 On arrival you will find lots of useful information available for you and your dog in our 'Fun Stuff'' folder. We are always striving to make improvements for all our guests including the four legged ones. 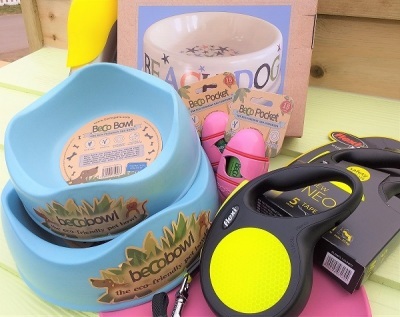 We have upgraded the feeding bowls which are now eco friendly and much prettier colours, added a feeding mat to contain thoses little spills, included a dog first aid kit along side the standard one for any little mishaps, there is a K9 water bottle for those days out and dog food forks. 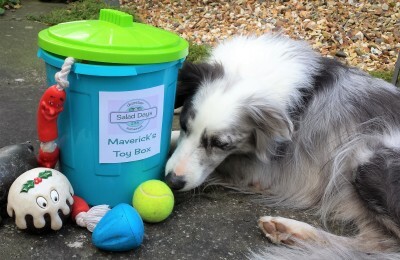 Maverick has very kindly decided to offer all his canine chums a selection of dog toys to keep them entertained when they stay.Toy bins will be kept in the outside storage boxes and Maverick will check they have been cleaned thoroughly for each new doggie guest. 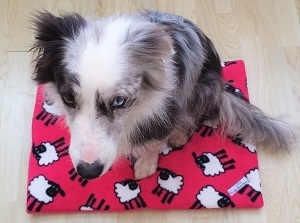 We like to support local producers, so we have teamed up with "Taylor Made on Exmoor" who make an assortment of dog accessories including some great dog blankets which Maverick can highly recommend. As you may know we had an old dog called Lola, who at nearly 17 years old was getting a little unsteady on her legs. 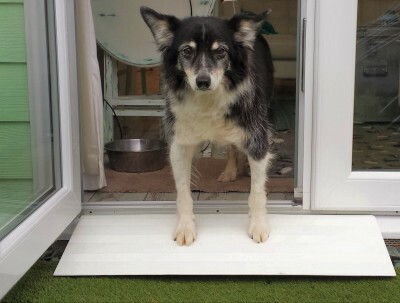 To assist her we decided to build a couple of ramps for the front and back doors at Salad Days, making it a little easier for her to get in and out. We then realised that some of our 2 legged guests might also find these ramps useful so, they will be available to all our guests. We send out a letter, well Maverick does, to all our canine guests a couple of weeks prior to arrival with details of a great local pet supplier, Williton Pet Care where guests can pick up those essential supplies either en-route or if needed, a delivery service is also available for Salad Days and Holi Moli guests during their stay. 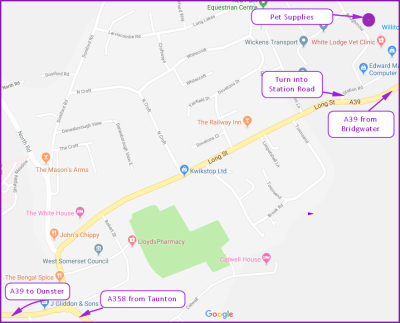 Williton Pet Care also offer a Dog Grooming Service so, a pamper session can be arranged for any dog wanting to look their best on holiday call 01984 631508. 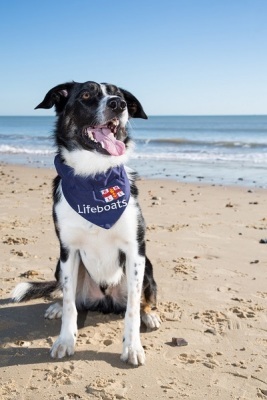 If you are thinking of bringing your dog on holiday with you and we hope you are, the RSPCA have put together a guide with some practical suggestions and tips for taking your dog away with you. 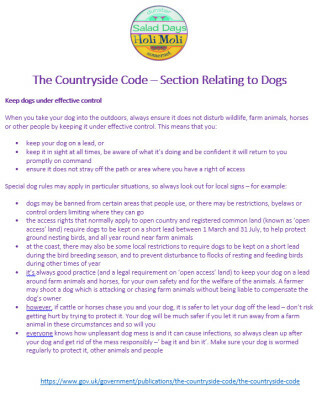 Click on the RSPCA document to view. 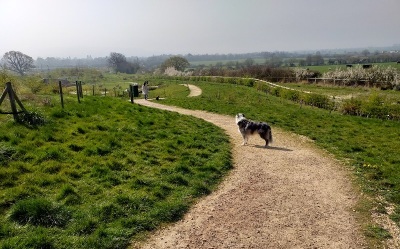 Should you be travelling on the M5 we recommend Gloucester Services as a great stop off for you and your dog, they have a dedicated dog walk area with water bowls. Your dog does not go on the bed. 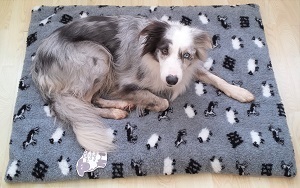 If your dog is used to sleeping on the sofa could we ask that you use the throws provided. 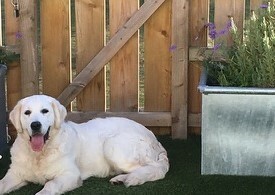 If possible please do not allow your dog to go to the toilet on the artificial grass, however if they do please use the watering cans provided immediately. Dogs must not toilet inside the property as this is unfair on other guests and will result in the loss of your deposit, they are able to be ‘toileted’ immediately outside the boundary (on a lead). 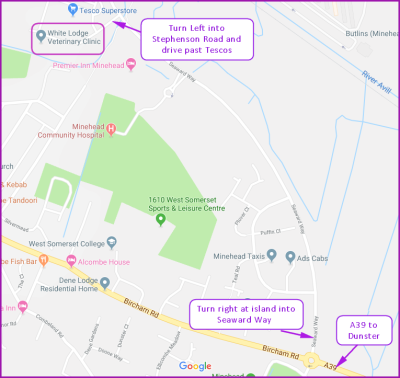 Please use the doggy bags provided and the nearest dog bin is to the side of the tennis court at Salad Days and to the side of the bridge at Holi Moli. 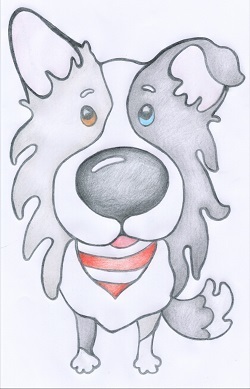 After a muddy walk please clean your dog using the towels, bucket, cloth and watering can provided (dog wash at Holi Moli) before entering the beach huts. 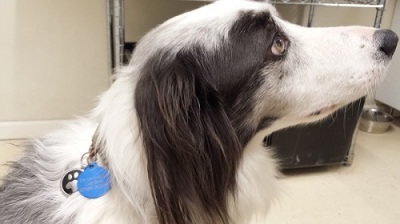 Make sure your dog is up-to-date with their vaccinations, flea and worm treatments. 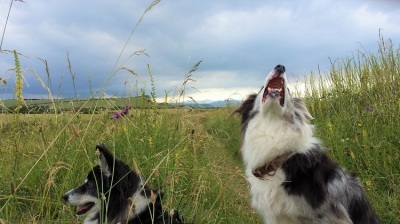 Keep your dog on a lead around the site and always follow The Countryside Code. There is no charge for your dog, yes dogs stay free of charge. As with all bookings we do request a refundable £100 security/damage deposit. Should no damage occur; if you book directly with us we aim to refund your deposit within 24 hours of your departure, if you book using an online booking site it can take up to 10 days after your departure. Should accidental damage occur we would ask you contact us immediately to enable us to replace or repair for your comfort and the following guest. Please note during 2018 all deposits were returned in full. We do ask that you inform us on booking if you have a dog. 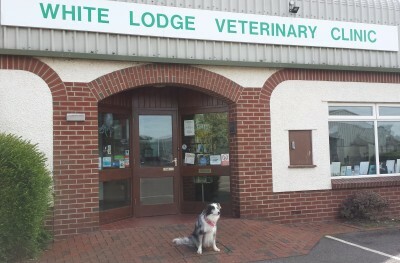 With most breeds we can accommodate up to 2 dogs but for the very large breeds or if you have any questions please contact us to check suitability prior to booking. 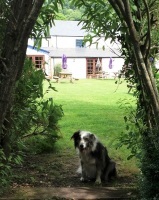 What could be better than going for a walk and finishing off in a dog friendly pub with your four legged friend. 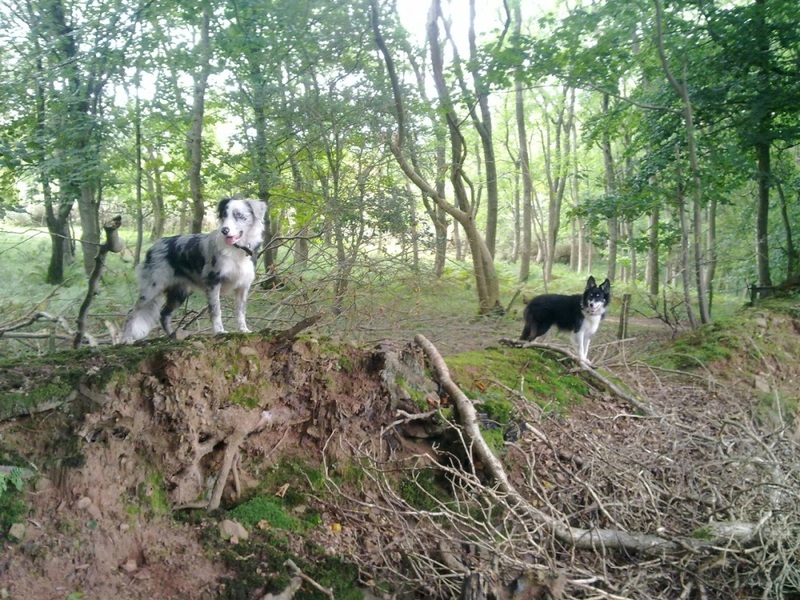 We have some great pubs in Dunster, Exmoor and Somerset that are dog friendly. 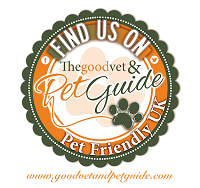 Why not see our 'eat and drink' page or use Doggie Pubs where you can search for dog friendly pubs throughgout Somerset and the UK. Dunster Beach allows dogs every day of the year! At Salad Days & Holi Moli we always have a copy of the latest tide tables for Watchet in the "Fun Stuff" folder so you can plan your dog walks on the local beaches. 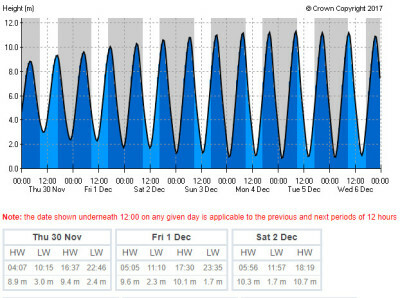 If you want to see tide times for other areas in Somerset use EasyTide which gives you free 7 day tidal predictions for any UK port. 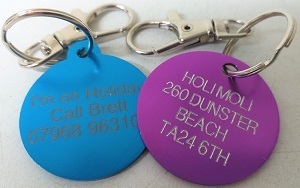 We also provide all dogs staying a temporary "I'm on Holiday" tag. 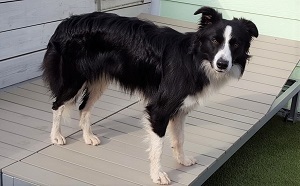 Then, should they get lost or stray whilst on their holidays at Dunster Beach we should be able to help re-unite them with their owners as soon as possible. We offer for any of our guests with dogs a 'dog sitting' service. 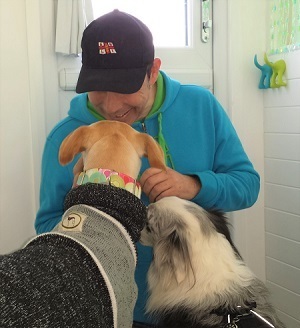 If during your stay at Salad Days or Holi Moli you would like a few hours out one night, but do not want to leave you dog alone in unfamiliar surroundings, we will come over and look after your dog for you. 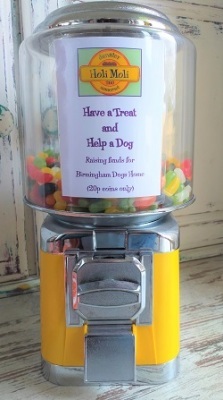 All we ask is that guests make a donation to the RNLI of £20 or more.